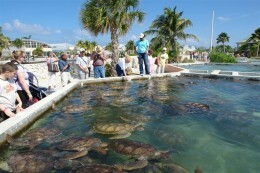 The owners have lived in the Cayman Islands for many years. Sean is a diver, yachtmaster, surfer, experienced fly fisherman and competes in many of the game fishing tournaments year round. 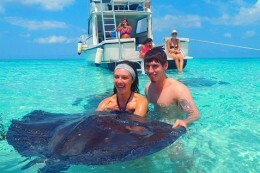 Jaki has worked in the hospitality industry on Cayman for several years. Be sure to ask the owners detailed queries about your interests and intentions during your stay so we can direct you to the best place during your visit. There is so much to do in Cayman and too little space to outline it all so here are some of the highlights for specifics on your trip. Enjoy your stay. Don’t forget your duty free shopping. Cameras, Watches Luggage and Beauty products. 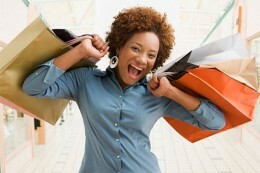 These Luxury brands such as Gucci , Rolex and Cartier are often found to be cheaper as there are no sales tax. So if you are after a good price on these selected items head into to George Town on a non cruise for a shop around. 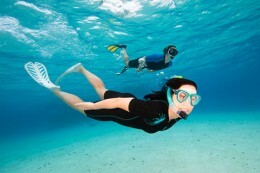 If you are interested in diving then Grand Cayman is one of the Top Dive Destinations in the Caribbean. Come and discover the fascinating fish life and learn about the ecosystem! You’ll find 365 different dive sites to explore which is easily accessible by a short boat ride. The warm clear waters provide sensational visibility with a vast array of marine life such as the beautiful tropical fish, turtles, stingrays, morey eel, lobsters and the occasional shark cruising by. 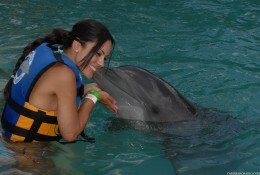 Swim with dolphins in Grand Cayman. Dolphin Discovery Grand Cayman's cozy facilities bring you the experience of a lifetime. A “must do” for any visitor to the Island. a wing span of 2 meters long. Their wings feel soft and gentle just like velvet. created and updated to enhance the experience that can be found at our world renowned attractions. Paddleboarding, Parasailing, Snorkling, Kayaking tours, Submarines, Surfing and Wave runners/Jetskis Are few of the fabulous watersports available for rent on the beautiful Isalnd of Grand Cayman. More details can be found on rates and operators in your condo with brochures provided. 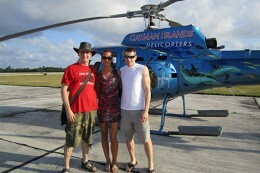 A helicopter sightseeing ride is one of the most exciting ways to see the Island. Follow the coast all the way round taking in the magnificent colours and true clarity of the Caribbean Sea the sumptuous homes hidden in view identify familiar landmarks from the air. A unique view of the island and surrounding waters. Great photo opportunity. Sunset flight and dinner package. 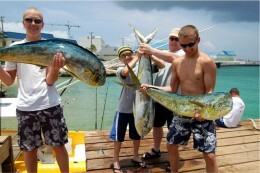 Private charters or a group for bottom fishing bone fishing or deep sea fishing out a 12 mile banks. Most trips depart from the North Sound ,most tour operators will pick you up from the hotel or condo.